In an effort to end the swirling controversy surrounding the circumstances under which a suspect Pakistani boat sank some 365km off the coast of Gujarat on January 1, the ministry of defence has released video footage of the vessel burning on the high seas. But the footage, which shows a boat burning for several minutes, raises more questions than it answers. Since the immediate trigger for the release of the visuals was the claim made by a senior Coast Guard official that the CG had destroyed the Pakistani boat, the ministry of defence thought footage of an intact boat burning would be enough to refute the notion that India had blown it up. What they forgot was that their initial press release had itself spoken of an explosion that the men on board had set off. The MoD statement of January 2 did not claim the men on board the boat were terrorists but it did assert that they had explosives with them. That statement also said that after having been chased by the Coast Guard for an hour, they stopped their vessel, went below deck and set the boat on fire, which “resulted in an explosion”. Sadly, the footage released by the MoD only shows the boat burning. And while it may help dispel the idea that the Coast Guard blew up the boat, it does nothing to press home the ministry’s original claim that the men on board had set off an explosion. The best way to put an end to the unseemly controversy over the entire incident is for the government to release that part of the extensive footage it surely has where the explosion actually takes place. If, as the MoD says, the fire and explosion were initiated by the occupants on board, the footage immediately preceding that will help establish that the Coast Guard vessel did not fire on or “blow off” the boat. The footage would also presumably show the boat breaking up into two of more parts as a result of the explosion rather than burning intact. 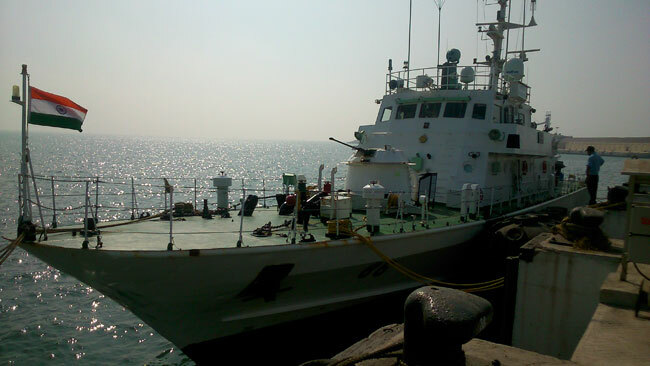 Though the MoD statement had said the boat burnt and sank and that nothing could be recovered, Shishir Gupta’s January 4 story claimed “spectroscopic analysis” had “confirmed the presence of explosives on board the rogue vessel.” Since the Coast Guard ship Rajratan returned to Porbandar only on the evening of January 3, it is not clear when this spectroscopy was performed. But if true, this analysis could also be made public Lastly, the MoD statement had said that the Coast Guard vessel had seen four men on board the Pakistani boat. Coast Guard inspector-general (IG) Kuldip Singh Sheoran, commander, Coast Guard Region (North-West), also told reporters that the boat crew were wearing shorts and T-shirts and did not look like fishermen. If the CG personnel got such a good look at the boat crew, they must have taken photographs and video recordings of the men. The MoD can easily make some of this evidence public too. In my view, the CG is to be commended for intercepting what was obviously a suspicious vessel. Even if they were smugglers rather than terrorists, the Coast Guard did well to give chase. At the same time, it is possible that the hot pursuit did not go smoothly and that the boat caught fire and sank as a result of tracer rounds or warning shots being fired. Accidents happen, and that could be one reason why the CG brass was not keen for the Indian Navy to look into the incident and undertook to provide a report to the government itself. Since the incident occurred outside the 12 nautical mile territorial waters limit, the use of lethal force may not have been legal under the Law of the Seas, especially since the MoD insists the CG vessel was not fired upon. Had the MoD not chosen to publicise the incident, what happened on the high seas would have likely stayed on the bottom of the ocean floor. But somewhere down the line, a political decision seems to have been taken to go public about another 26/11 incident having been averted – without due attention paid to whether the official story would stand up to scrutiny, and what the diplomatic and political fallout would be if the story fell apart. If the government baulks at releasing the video evidence mentioned above, it’s account will remain unconvincing. A hyper-nationalist media may choose not to ask any more questions but internationally, many of India’s friends are likely to be sceptical. Have your say. You can comment here.There is one last point: With no less a person than the raksha mantri himself saying India had evidence that the men on board the suspect boat were constantly in touch with the Pakistani military, it beggars belief that the government vernment of India has not raised this matter diplomatically with Islamabad. After 26/11, India tried hard to establish the identity of the Pakistani military personnel it believed were involved in the Mumbai attack so that they too could be charge-sheeted. The sudden change of heart now is a little surprising. This entry was posted on February 22, 2015 by Siddharth Varadarajan in Indian Foreign Policy, Pakistan, Terrorism.